Sanitisers and the Use of Environmental Alternatives in Food Industries. 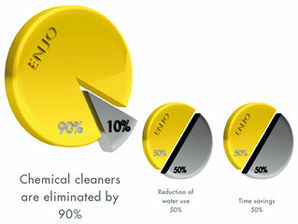 In short, it was a study between eight different cleaning methods to sanitise surfaces, of which one was ENJOtex fibres. The rationale behind their study were that continuous use of chemicals may lead to bacterial resistance, which allows bacterial growth on both the surfaces and the equipment (Holah et al., 2002). Therefore the scientific team conducted the study to evaluate environmental conscious alternatives for sanitation that are thought to reduce risk of chemical inactivation, bacterial resistance, and chemical exposure to humans. Since any sanitising method needs to be correctly applied for it to be effective. For example, detergents or chemical sprays needs to be applied at least 30 minutes before the surface is wiped by a cloth. Immediate wiping reduce the effectiveness of such chemical sprays, as it does not have sufficient time to kill the bacteria. Additional to this, the quality of the cloth used to wipe, and the frequency of rinsing and properly sanitising the cloth itself contributes to the effectiveness of the sanitising method. At most, low quality cleaning cloths can clean no more than 50 cm². Bacteria also replicate over time, therefore any hygiene test after sanitation needs to be done in consecutive time intervals to monitor bacteria growth. Dr Dingle and his team measured bacterial growth over time, up to 6 hours after sanitisation. Sanitisation with ENJOtex fibres resulted in a significant lower count for S. Aureus, than any of the other 7 sanitisation methods (Lalla, Dingle & Cheong, 2005). S. Aureus is a gram-positive coccal bacterium and is a common cause of skin infections such as abscesses, respiratory infections such as sinusitis, and food poisoning. Pathogenic strains often promote infections by producing potent protein toxins, and expressing cell-surface proteins that bind and inactivate antibodies. Lalla, Dingle and Cheong (2005), reiterated the importance of controlling the concentrations of chemicals for proper sanitisation and food quality, as too much chemical use will affect the taste of food, and too little will render the sanitisation process ineffective. The major factors that contributes to overall poor hygiene standards in South Africa are the general background and educational level of the average cleaner, as well as the overall lack of attention and oversight of proper sanitisation methodologies from management. This results for example that chemicals are mixed with the incorrect amount of water at incorrect temperatures. Another major problem is the frequent reuse of cleaning cloths without proper sanitisation of the cleaning cloth. Poor quality cloths may require higher frequencies of sanitisation of the cloth, as apposed to higher quality cloths. tage, as fibres are recycled, and reused, as well as the reduction of the use of chemicals reduces plastic landfil, and toxic chemicals entering the water system. It is therefore simpler to train your cleaner to clean with ENJO, in order to achieve at least a 6x cleaner environment that is not only healthier for you, your guests, kids and animals, but also for the cleaner constantly exposed to harmful and toxic chemicals. Lalla, F., Dingle, P., & Cheong, C. (2005). The Antibacterial Action of Cloths and Sanitizers and the Use of Environmental Alternatives in Food Industries. Journal of Environmental Health. Dec 2005, 68, 5. Hollah, J.T., Taylor, J.H., Dawson, D.J., & Hall, K.E. (2002). Biocide use in the food industry and disinfectant resistance of persistent strains of Listeria monocytogenes and Escherichia coli. Journal of Applied Microbiology Symposium Supplement. 92. 111S – 120S.